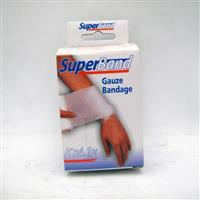 SuperBand Gauze Roll Bandage 3" Conform. Stretch gauze. An elastic gauze bandage made of unifrom weave of cotton and polymer yarn. Recommended for Elbow, Knee, or Ankle, ideal for hard-to-bandage areas and where flexibility is needed. 24 rolls per case. 5.12" x 7.87" x 7.48"